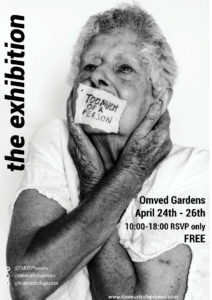 100 womxn and non-binary people’s “too much” stories and portraits will be exhibited at the tranquil OmVed Gardens in Highgate. Photographed and interviewed by photographer Diana Patient, come and get lost in stories of shame, finding your voice, being told you are “incorrectly female/male”, how your ‘too much’ is actually your power and womxn and non-binary people’s hope for a better world. Write a Too Much of a Person postcard to someone, enjoy the weeping willows and birdsong, hear our collected stories and feel less alone. Multimedia exhibition: print, word, sound, film. We are excited to announce that Doodle Arts will be continuing its art classes for the Summer Term at Jacksons Lane in Highgate every Wednesday 4-5 pm. 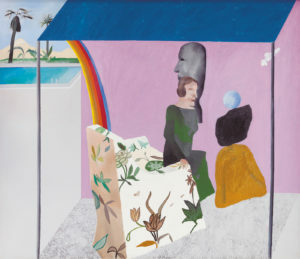 All sessions are specifically design to help children develop their artistic skills and knowledge by using a combination of mediums and techniques such as painting, drawing and printmaking. Drawing inspiration from contemporary artists as well as the great masters and the History of Art we will be exploring fundamental notions in fine art like composition, prospective, tone and texture while at the same time encouraging creative thinking and imagination and most importantly having fun! Starting date: 24th April – 17th July 2019 ( excluding half term week starting 27th May). The sessions are suitable for ages 5-11. All materials are provided. All bookings and payments for the Summer Term should be made by Friday 19th April. 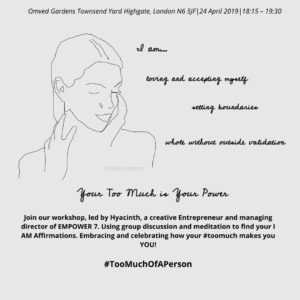 Using Group discussion and Meditation to find your I AM Affirmations and Embracing whilst Celebrating how your #toomuch makes you YOU! Guided meditation, group discussion, creating personalised affirmations. Hyacinth is a Creative Entrepreneur, International Speaker, Author, Artist and Small Business owner/ Founder/ Managing Director of EMPOWER 7 a Women’s Personal Development Programme est. 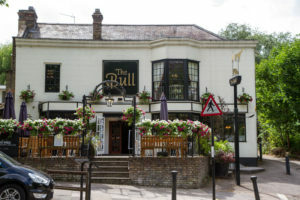 in 2017. She is also an Award winning “Woman of Honour” who celebrates 30 years of Service to Community in 2019. As a qualified Holistic therapist she uses an intuitive, nurturing approach to working with people and feels the energy in the room creating a more bespoke workshop. 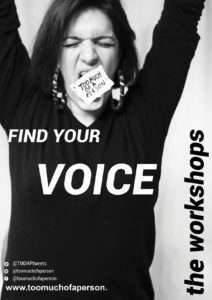 An interactive workshop which will give the participant one more tool to express themselves with; whether that’s how to speak with nerves, how to speak up or using the voice as a instrument that will be truly listened to. Too Much of a Person is an incredible platform for womxn and non-binary people to express themselves and we want to be even louder than we were taught to be. This workshop is one part of the process. A stronger, more empowered voice. Knowledge how to build the voice even more and definitely a smile on their face and a true sense of joy. 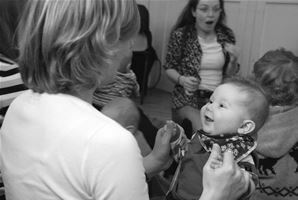 Breathing, posture and vocal exercises, making sounds, turning sounds into singing. Singing a song together as a group.Strengthen your speaking voice, free yourself physicially (chest/throat) and mentally (blockages)! For her young age, Nina Rosenberger boasts a big bag of musical experience and expertise. She was playing piano at 6 and was directing her first choir at the age of 19. Since those skilled beginnings Nina has continued to be prolific in her involvement with vocal performance and leadership. She has been musical director of several bands, vocal coach for private students and choirs, keyboard teacher and one-on-one music production tutor for high school students. Nina graduated with first class honors in vocals from BIMM in 2015 since which time between working with students she has been an active performer with vocal bands such as “Soundslike”. Acting as musical director/pianist and backing vocalist in several exciting projects, she also writes her own songs and performs them under the name “Anin Rose”. Her performances include O2 Shepherds Bush and touring in Germany. As well as all this, Nina has been taking her musical gift into a different context by working in mental health settings with people with disabilities and mental health challenges. A few years after graduating, she is now also back as a Vocal tutor at BIMM London. This workshop is brought to you by Too Much of a Person as part of our week long celebration of the launch of our online archive of 100 womxn and non-binary being called ‘too much’ to dismiss or conform them to the idea of what a “woman” should be. Womxn and non-binary people may miss out on certain “soft skills” growing up (speaking up or confidence) because of their gender or carry unhelpful interjects they have learnt from childhood (gendered shame or ‘imposter syndrome’). We have some incredible professionals who have volunteered their time to bring you these free and accessible workshops for this week only. Don’t miss out and lovingly arm yourself for the world! Iyengar Yoga Thursday Morning Classes for Adults / Beginners / Experienced /Newbies. Pond Square Chapel hall is Light /Bright/ Warm space with Wooden floors. Blocks, Straps, Blankets, Chairs provided. Kirsty is a IYANZ qualified Yoga teacher with 18 years Performing Arts experience. Gives you a relaxing / rejuvenating / integrated class. Bring a friend and sign up to receive 20% Early-Bird discount. Sign-Up Full Summer Term £96 Includes 20% Discount. Or drop-in £10 a class. Dennis Rice (assisting) is a Gestalt-trained counsellor, meaning he follows in a school of thought in which he encourages his clients to be more present; and so find through their being more in the “Here and Now” they function better and become more resilient to life’s challenges.